As Private Jet Charter ourselves after having constant problems with paper luggage Tags, whether they were getting tatty and torn or simply being ripped off – especially on longer journeys. We came up with the idea for supplying personalised crew tags for airline staff all over the world, without charging the earth for them! 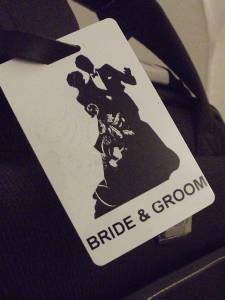 Since then we’ve grown and now offer our personalised luggage tags to both crew and passenger alike – with eye-catching and robust luggage straps and tags that will stand up to even the most enthusiastic baggage handler. Rushjets luggage tags are available in almost every airline livery we know of - but if you can’t find yours, let us know and we’ll add it to our list so you can get your own airline colours on your luggage tags. Each crew tag comes with the airline logo on one side and your own personalised information on the other – such as name and crew number. Please be aware that the leather strap is sold seperately. You can purchase this tag with the strap via. the variation listing at the top of this page. Spend £3.99 more to reach FREE SHIPPING! Continue shopping to add more products to your cart and receive free shipping for orders over £200.99.